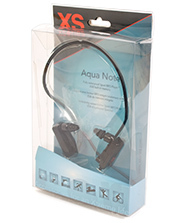 XSories Aquanote waterproof MP3 player was designed for a multi use watersports enviroment. Especially good for swimming and also great for triathlons due to its headband design. 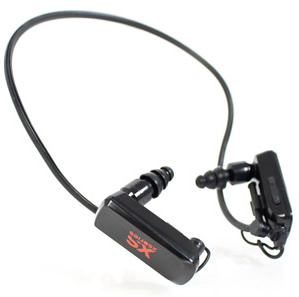 This waterproof MP3 player has great sound quality and adjustable waterproof headphones so the ear buds can easily be aligned with users ear canals. The headphones are soft, flexible and a barbed style for a tight firm yet comfortable fit. The Aquanote now comes with 2 different styles of earbuds - mushroom & barb in small medium & large sizes. 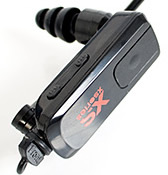 The XSories Aquanote waterproof MP3 player secures low on the back of the head so a helmet can be worn with the unit if needed. Great for swimming, running or cycling in all weathers. No need for an armband or headphone cables. No fiddly settings or loose cables.